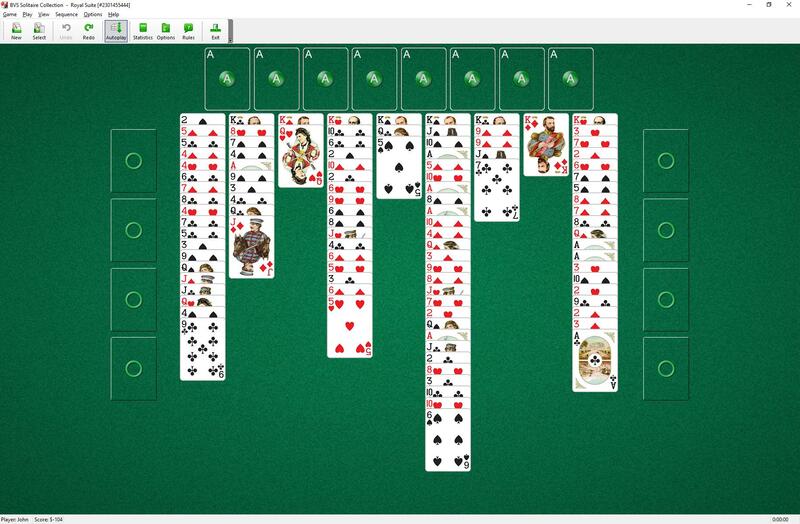 This solitaire uses 104 cards (2 decks). You have 9 tableau piles. 8 foundation piles are placed above the tableau piles. Eight reserve piles are placed to the left and to the right of the tableau piles. Cards are dealt on the first tableau pile from the stock pile until the King. The King is placed on the second tableau pile. All the following cards are dealt on this pile until the next King etc. Only the top card of each pile is available for play. You may build tableau piles down in sequence and alternating color. 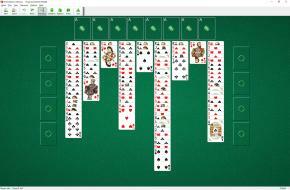 One card or group of cards in the proper sequence can be moved from pile to pile. Empty tableaus cannot be filled. Each reserve pile may contain only one card. Cards in the reserves can be moved to the foundation piles or back to the tableau piles, if possible. This solitaire is a variation of Cat's Tail.